It's no secret I'm a fan of what the Japanese offer in terms of reinterpretations of americana. It seems like they just get it, when actual americans just don't. I think it's because many of us are just too close to see it and are blinded to what makes our culture great. Nonnative is one of those brands coming out of Japan that are doing everything right. Two big gripes about the brand though, 1. it is damn near impossible to get it in the U.S. and 2. it is japanese sizing so that means finding something that fits right (having to purchase it online) is a risky and possibly disastrous effort. Let's just hope the hype train keeps moving and this collection sees the light of day. 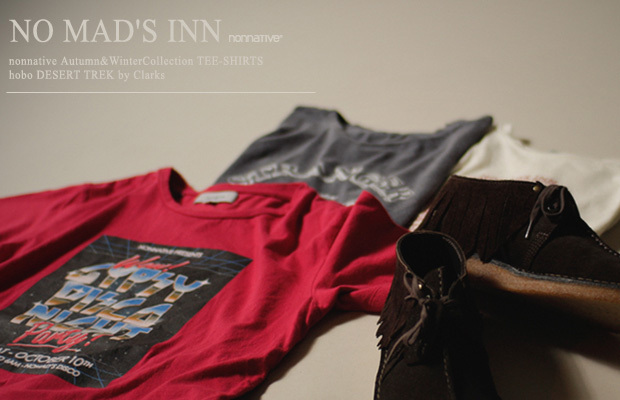 Highlights from the small preview are above in the form of clarks look alikes, screened tees and denim. More information and pictures here.